Electric scooters have become a common sight in this current day and time. What's so cool and interesting about electric scooters is that there are so many different types! However, before we get into the nitty gritty details of the different types of electric scooters, let's take a look at what they are and how they work. An electric scooter is simply a small vehicle that operates on electric power. It doesn't require fuel or oil to function and operate. Electric scooters are generally used by all age groups depending on the purpose. What are the Types of Electric Scooters? It may help you to know how an electric scooter works before you buy one. It's actually very simple. They operate by the combination of a small motor and a battery. The battery generates the motion power in the motor and thus the electric scooter moves. Like any other electrical device or vehicle, the battery is charged by plugging it into a power outlet. Whether it's on a stand-up scooter or a riding scooter, the speed and brakes are generally controlled by buttons and switches on the handle. This makes it super easy to operate and use. Just knowing these basic operations will help you to find the best electric scooter for your needs. There are many types of electric scooters. Some of them are used for recreational purposes while others are used for medical services and purposes. Let's take a look at the different types of electric scooters and then dish out the nitty gritty details of each one. As you can see, there are many kinds of electric scooters. Essentially, there is one for nearly every occasion and need! Let's take a closer look into each one so that you can have a better idea of which one will best suit your specific situation and desires. Electric kick scooters are likely the most popular form of scooters in terms of recreation and fun. Children, teenagers and adults all take pleasure in riding these little cruisers. They can be found in fun kid colors or more serious, laid back colors for adults. 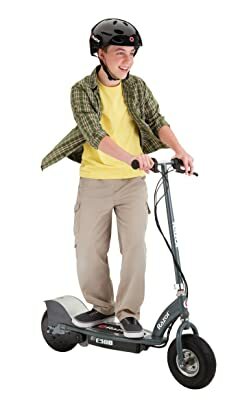 The main reason that children and teenagers love the electric kick scooters is that it gives the sensation of freedom and fun travel around the block. These scooters are very safe and never run at dangerously high speeds. In fact, on average operation, electric kick scooters typical run at speeds of about 10 to 12 mph. 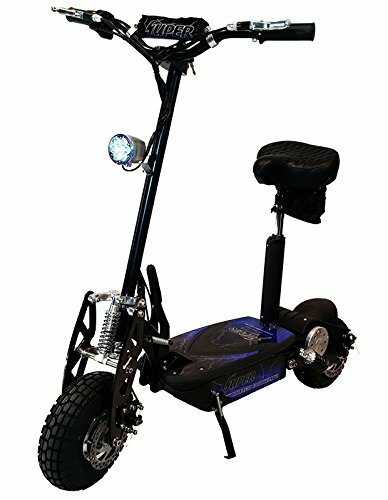 Let's look at a great electric kick scooter on Amazon. 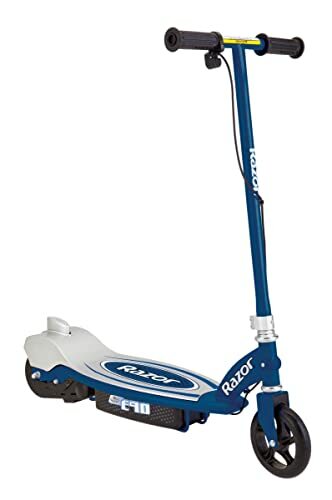 Razor is probably one of the best electric kick scooter brands. Prices do vary as there are incredibly affordable ones to extremely expensive ones. 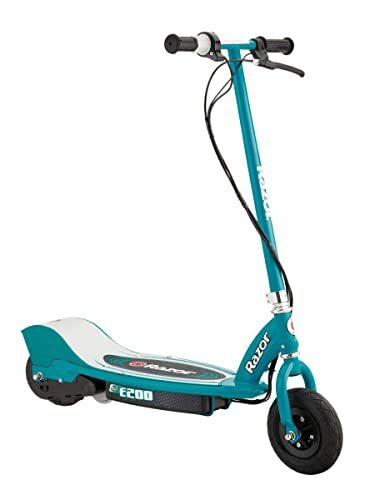 However, the Razor E300 Electric Scooter is set at an affordable price that's guaranteed to provide incredible quality and many fun times. The Razor E300 comes in a matte gray color. There are many details about this particular ride so hang on tight. It's powered by a 24V seal battery system. For the first, initial charge, it takes about 12 hours for it be ready for operation. However, for the recharging time, it's recommended that they charge for a maximum of 24 hours in order to operate properly. Once it's fully charged, the Razor E300 will run for a solid 40 minutes. However, you should keep in mind that the run times may vary from scooter to scooter depending on the riding conditions, weather and maintenance. Speed is another detail that you should for when purchasing an electric kick scooter. (Especially if you have a young child that will be using it regularly.) The Razor E300 reaches a maximum of 15 mph! That's high performance and ability right there! As for the design of the electric kick scooter, it comes with a hand operated rear brake that ensures safe stops. The tires are extra wide with 10 inches in width. This allows for a very smooth ride and helps with the speed as well.The throttle is designed with a convenient twist grip that allows for easy use. Finally, another great detail about the Razor E300 is that is has a large deck and frame that supports all riders of any size. This means that this particular ride can work great for the children as well as the parents! 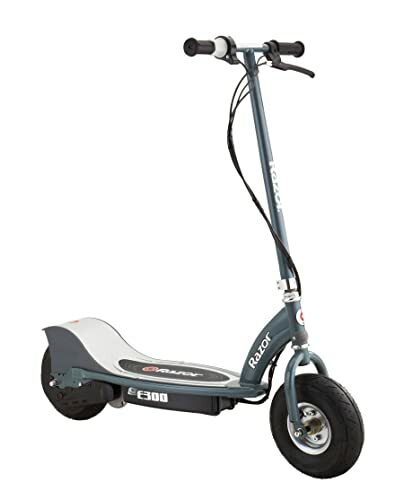 The only cons to electric kick scooters are the long charging time and the significantly shorter operation time. Other than that, everything is a plus! Did it ever occur to you that electric wheelchairs are in fact electric scooters? Yes, indeed! 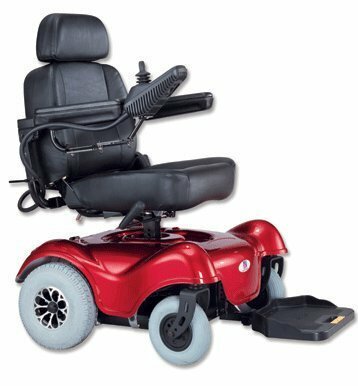 If you're in need of an electric wheelchair scooter, then this guide should help you to make an informed decision on purchasing the best one for your specific needs. Let's take a look at a great electric wheelchair scooter on Amazon. The IMC Heartway Rumba is guaranteed to satisfy your needs and get you the movement and mobility that will enable you to function like normal. The IMC Heartway Rumba is a HP4 power electric wheelchair scooter that's easily operable. Even better? It's easy to disassemble and transport to wherever you need to go! It has a 4600 RPM motor that is operated by two 12V batteries. It will drive a total of 22 miles on full charge until it needs to be recharged. The maximum speed for the IMC Heartway Rumba is 4.5 mph. It has a weight limit of 300 pounds and comes with a swivel seat and headrest. The turning radius is at the measured distance of 20.5 inches. It has self-generating brakes that make it super safe to operate. It has an all metal frame that offers incredible strength and resistance. The rear anti-tip casters also provide extra security and protection. As for the wheels, it has 10 inch rear driving wheels. The front comes with 8 inch wheels. Now let's take a look at the designing details. You can choose from 3 body colors and 2 seat colors so that it can be as personable as you would like. Again, this particular type of electric scooter is for anyone that is disabled and cannot walk on a daily basis. It isn't something that's used for fun like the electric kick scooter. The IMC Heartway Rumba is designed for helping the medically disabled. The only con is that it can't get any faster than 4.5 mph. Then again, since it's a scooter for the disabled, that can also be seen as a pro. Electric mobility scooters are similar to the electric wheelchair in that they help the disabled. However, they aren't as strictly designed as electric wheelchairs. Generally, the electric mobility scooter is designed for those that can walk but tire easily and need some assistance. You've probably seen many of these type of scooters in large general stores awaiting customers that need to get off of their feet as they shop. Let's take a look at a high quality electric mobility scooter on Amazon. The Bobcat scooter has a very compact design with 4 pieces that make up it's assembly. This provides easy build and tear down options for when you need to transport the scooter. It reaches a top speed of only 4 mph but has an incredible turning radius of 35.4 inches.It has an operation range of 7.5 miles. This doesn't seem like a lot but considering that most people don't use mobility scooters 24/7, that's actually a long lasting charge. It comes with a comfortable, adjustable seat and arm rests. (The seat has a flip back.) The front of the scooter has a convenient carry basket that allows for easy shopping trips and holding of items. The anti-tippers add to its protection and safety. Even better? The tires are considered to be flat free! Design wise, it comes in the color of blue with black seats. The only con is that it can only drive for 7.5 miles before it needs a full charge. However, the major pro is that the tires are flat free! Again, this particular scooter and other electric mobility scooters aren't for fun and recreational purposes. 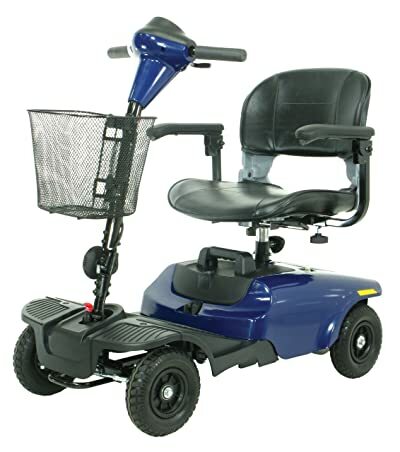 They are designed to assist those that have trouble walking and moving around. 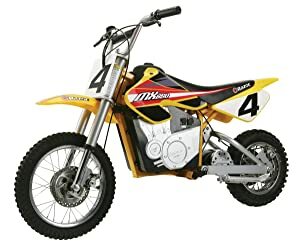 Electric dirt bikes are increasing in popularity. 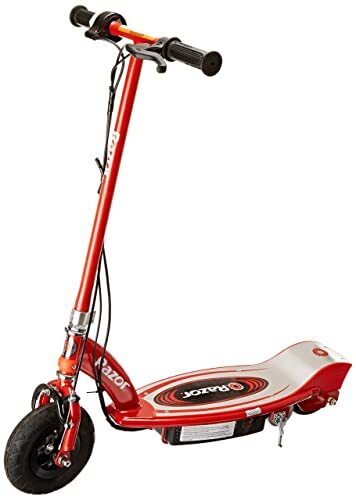 These form of scooters don't even look like scooters on the outside. However, due to their internal operation, they are indeed high powered electric scooters. The cool thing about electric dirt bikes is that it offers the same fun benefits as that of the real thing. Let's take a look at an electric dirt bike that's available on Amazon. Once again, the brand Razor offers spectacular rides in the form of scooter technology. This compact, electric motocross dirt bike offers a powerful experience with its 650 watt electric motor. It can travel up to 17 mph and with an operating time of approximately 40 minutes. Keep in mind that this particular ride is only recommended for people that are 16 years of age and older. It is NOT recommended for kids younger than 16 years of age. It has the cool design of an average motocross dirt bike that makes the riding experience even more fun. It comes with dual suspension and riser handlebars for a smoothe, easy and comfortable riding experience. The rugged tires offer maximum power during operation and the motor is actually very silent while in operation. Who wouldn't enjoy an elecric powered dirt bike without the loud engine sounds and noises? That's awesome! Finally, the final charging time for the Razor Dirt Rocket is approximately 8 hours. The only con to this model is the short operation time. Then again, that's to be expected with electric motors and scooters. Electric bicycles are basically the same thing as the electric motorcycles and dirt bikes. However, these forms of electric scooters are often seen on the streets of European towns. If you need to make a quick trip to the supermarket that's just around the corner, this option would be the perfect method of transportation. 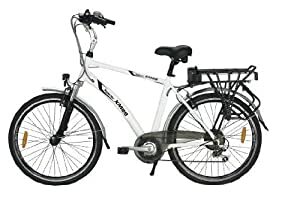 Electric bicycles also offer tons of fun and enjoyment outside of necessity and convenience. Let's take a look at a popular electric bicycle that's available on Amazon. The Yukon Trails Electric Bike is a very cool toy. Colored in white and black, it’s pretty gorgeous to even the non-bicyclist. The great thing about the Yukon Trails bike is that it’s stylish, economical and convenient. This bike is a 7 speed, hybrid operated machine that allows you to cruise through the neighborhood with ease. The battery (36V/10AH) is charged by a removable Lithium Ion battery pack. This gives you the option of charging the battery pack indoors! The motor is a 250W, 36 brushless alloy that’s able to reach speeds of up to 15 mph. In a single full charge, the Yukon Trails bike can operate for up to 31 miles. Don’t ever worry about your speed getting out of control because the Yukon Trails comes with a speed sensor controller called 36V brushless PAS (pedal assisted system). This helps you to keep your speed under control and comes in handy quite often. The tires are by Kenda and have the measurements of 26 inches and 1.75 width. The rims are made out of an alloy double wall that provide you with a smoother ride. Tektro V brakes are built into the front and back side of the bike. This allows you to arrive at a complete stop from a safe distance. A huge pro for the Yukon Trails Electric Bike is undoubtedly the ability for it to provide effortless transportation to close by locations without the need of fuel or oil. This is how it provides tremendous economical relief. Now that we have covered the different types of electric scooters and an example of each, let's discuss our recommendations and tips. 1. When you're shopping for the best electric scooter, it's important to determine what type of scooter that you need. Are you searching for an electric scooter for your children or teenagers to play with and have fun? Or do you need something for medical needs and purposes that would help you or a loved one to have some mobility? This will help you narrow down the search since the term "electric scooter" can be so broad. 2. Always be weary of weight limits on the electric scooter that you're eyeing. 3. Ensure that you find out how much run time the scooter has and how long it takes to charge the battery. 5. For the electric kick scooters and the electric bikes, closely examine the safety mechanisms and details if you're making the purchase for your children. It's always better to be safe than sorry. 6. Compare the speed of one electric scooter to the others. For mobility scooters, the running speed of 4 mph is plentiful. However, for the fun and recreational electric scooters like the kick scooters or bike scooters, running speeds of 4 mph may be a disappointment. 7. If you're purchasing an electric wheelchair scooter or mobility scooter, carefully study the assembly and tear down. If you will be transporting it a lot, you won't want one that is pesky and complicated in piecing back together and taking it down. If you're in search of the best electric scooter, with the knowledge you've gained from this article, hopefully you can make an informed decision on which one would work best for you and your situation. Remember that there are many fun choices for the electric kick scooters, dirt bikes and bicycle scooters. From the many cool colors and designs to the operation speeds and comfort, people of all ages thoroughly enjoy these type of rides. There are also some fun choices for the electric mobility scooters and wheelchairs. Some of the colors, designs and techniques can create a positive experience with these type of electric scooters.